It’s well known that funding for conservation is seriously lacking, so we’ve had to get creative when it comes to raising money to protect New Zealand’s little ray of sunshine, the hihi. Research careers are funny things. One minute you’re planning out how you’re going to secure a permanent position and a Prime Minister’s Science Prize (#dreams). 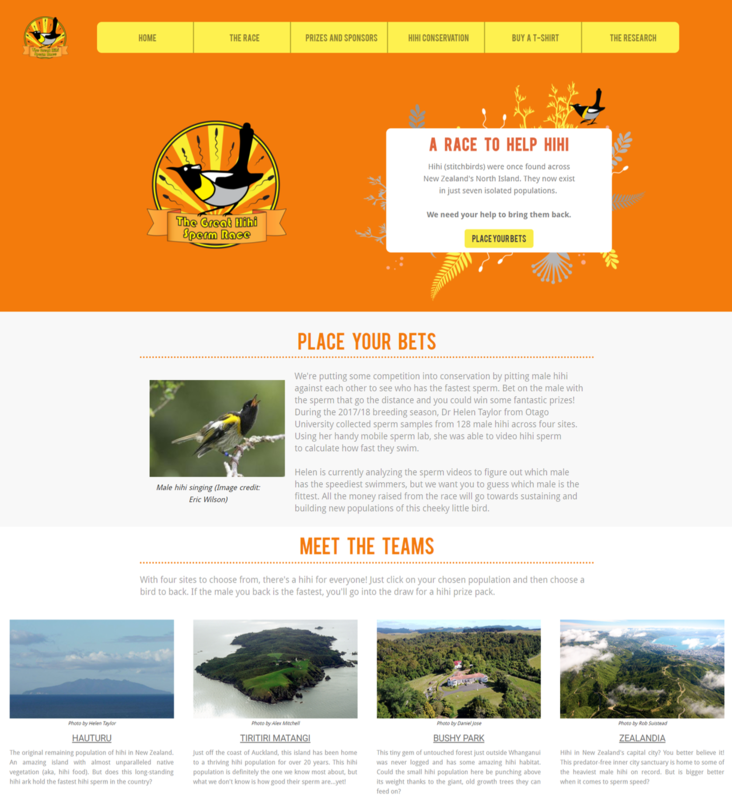 The next you’re encouraging people to bet on bird sperm races to raise much needed cash for a taonga species. As a researcher, I measure sperm quality across several New Zealand bird species (wondering why? Fair enough – read this, related post.). One of my study species is the hihi or stitchbird, perhaps one of New Zealand’s least well-known, but most charismatic avian critters. It’s not surprising that people are not familiar with this bird; hihi are really difficult to see. 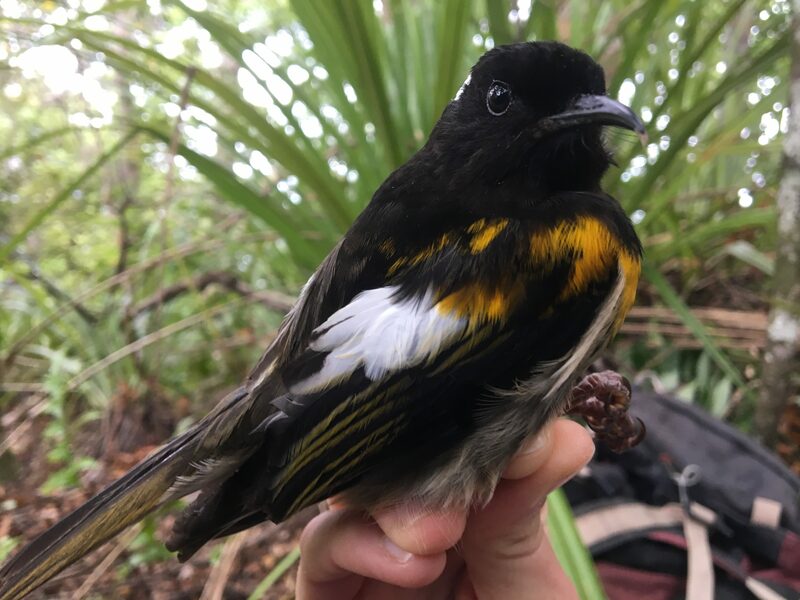 They were once widespread across the North Island but, thanks to the arrival of both humans and their associated problems, by 1880, hihi could only be found on Hauturu (Little Barrier Island). Thanks to the hard work of the hihi recovery group and a large group of associated researchers, sanctuary management teams, and associated volunteers, there are now seven populations of hihi and numbers are growing. However, hihi are extremely reliant on continuous management. All populations apart from the original one on Hauturu require supplementary feeding with sugar water to keep going. 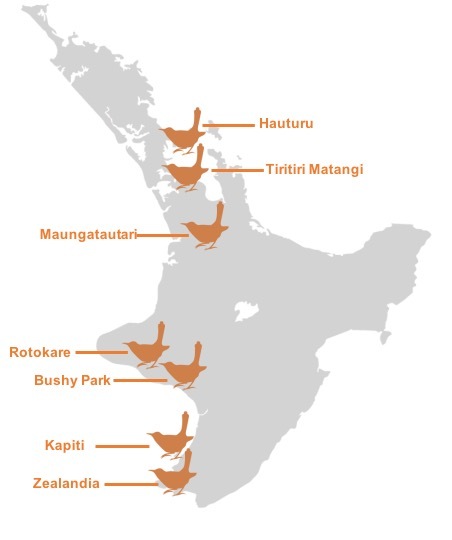 Five out of the seven populations are reliant on nest boxes for hatching their chicks. Are hihi just a bit rubbish? No, they’re not. But they seem to need complex, old growth forest habitat. There just isn’t much of that around in New Zealand anymore thanks to logging and land clearance. Finding new sites to relocate hihi to that won’t require supplementary feeding and nest boxes has proved almost impossible. That makes hihi conservation an expensive business. But not many people know about them, so they don’t receive much funding. Come and join us online at www.hihispermrace.nz. Back a bird and support hihi conservation. During the 2017/18 hihi breeding season, I sampled sperm from male hihi across four of the seven current populations. One night, myself and two other hihi researchers, Alex Knight and Mhairi McCready, were sitting around on Tiritiri Matangi Island shooting the breeze about hihi and, obviously, their sperm. We decided to run a small sweepstake among ourselves to guess which of the males would have the fastest swimmers. Over the next few days, we realised that this could develop into a much bigger idea. A weird idea, for sure, but one that might help raise much needed funding for hihi conservation AND get people talking about hihi (and sperm…but mainly hihi). And so, following a few months of planning, web-design and checking to ensure we’re abiding by the rules of running a charity gambling event in New Zealand, we are launching the Great Hihi Sperm Race. The idea is simple. I have measured sperm swimming speed in 128 male hihi. All of these hihi are now listed on our www.hihispermrace.nz website where you can place a $10 bet on which male you think will have the fastest sperm. You can bet on as many birds as you like. Whoever picks the birds with the fastest swimmers are in to win a whole bunch of prizes. Prizes like free family passes to brilliant local sanctuaries like Tiritiri Matangi, Zealandia, and Maungatautari, and prizes we can ship anywhere in the world, like cases of hihi wines, and Tumbleweed T-shirts – all donated by our extremely generous sponsors.